THE Sani Abacha Stadium in the heart of the commercial nerve centre of the ancient city of Kano, Kano State, yesterday witnessed an unprecedented turnout of residents and supporters of the All Progressives Congress (APC). Supporters of the party from the 44 Local Government Areas of the state converged on the stadium, as the campaign train of President Muhammadu Buahari berthed in the state ahead of the February 16 presidential poll. Buhari, who was all smiles as party leaders took turns to address the crowd, said: â€œWith the demonstration (massive turnout) witnessed here, I will tell you that I will continue to fulfill the promises I made to you in 2015, which bordered on security, corruption and economy. â€œWe have promised Nigerians three major issues concerning our survival as a nation. They are fight against corruption, security and economic revitalisation. â€œIn these areas, I will like to boldly say that we have delivered our promises to the electorate, he said, adding: â€œIf you like you can asked those that came from the Northeast since they use to come to Kano to do business, most them have since returned to their houses and we see that as a significant development. â€œI want to remind you that the promise I made to you Nigerians to enhance security has been fulfilled and you can confirm this from the people of the Northeast, since you people have business relations and they will confirm to you that they have returned to their homes. This shows that we have achieved security as promised. â€œOn the side of development, we have had two successful rainy seasons during which the government provided fertiliser at subsidised rates to farmers in the country, during which we had a bumper harvest. â€œWe have banned the importation of rice to enhance local production because as a country we have the capacity to feed ourselves and that is a great achievement. â€œWe want to assure you that we made a promise that we will never fail you. The truth of the matter is that I have been a governor, minister of Petroleum, I have been a Head of State and now a politician. Governor Abdullahi Umar Ganduje told the crowd that Kano State remains President Buhariâ€™s stronghold and that â€œKano politics is about him and him aloneâ€. The governor said the President had done a lot in the state, citing, the Lagos- Kaduna-Kano rail being constructed as an example. He said that the state government will soon invite the President to inaugurate some projects. The governor called on the electorate to come out en masse and vote for President Buhari on February 16, to keep the promise of giving him five million votes. APC Presidential Campaign Councilâ€™s Director-General Rotimi Amechi carpeted the Peoples Democratic Party (PDP) presidential running mate Peter Obi for not being truthful during the television programme â€œThe Candidateâ€. He said the former Anambra State governor fed Nigerians with lies by saying that they completed payment for the various railway projects embarked upon by past administrations. According to Amaechi, the Federal Government borrowed money for the completion of the Lagos-Ibadan Expressway. 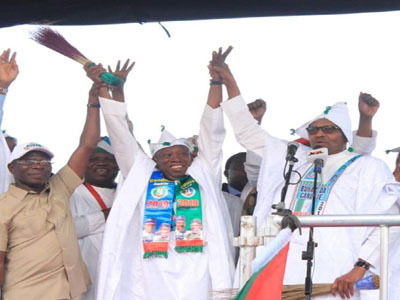 The highpoint of the rally was the presentation of flags by the APC National Chairman, Adams Oshiomhole to Ganduje as the governorship candidate. The senatorial and House of Representatives candidates also got the APCâ€™s flags.